Because of its location on horses, dogs, and cats we advise you err on the side of safety when using GV 26. You don’t want to be bitten or injured. The animal would not intend to hurt you but when in a traumatic state, he may not be aware of his reactions. 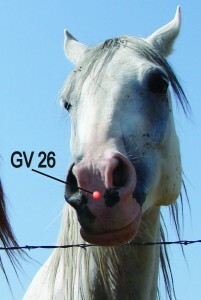 Horses – GV 26 is located on the dorsal midline between the ventral limits of the nostrils. 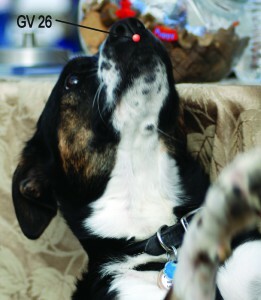 Dogs & Cats – GV26 is found on the vertical line on the upper lip at the level of the lower edge of the nostrils. It is said that GV 26 is located at the junction of the Governing and Conception Vessels, which is why it is so effective when there’s an a separation of yin and yang. Loss of consciousness is characterized as a separation of yin and yang. Additionally, GV 26 is considered the Meeting Point where the Governing Vessel converges with Large Intestine and Stomach Meridians. Other Functions and Energetics: Due to its location, GV 26 has a host of functions. This acupoint can be used for facial swelling or paralysis, motion sickness, lip tremors, mouth and gum problems, nasal infection, TMJ issues, fright/panic, and acute lumbar pain. The energetics of GV 26 includes: cools heat, clears the senses, calms the shen, promotes resuscitation, eliminates internal wind, and benefits the lumbar spine. Given the range and power of GV 26, it’s a handy and truly amazing acupressure point to have at the ready!